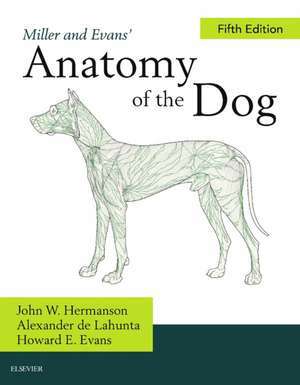 Featuring unparalleled full-color illustrations and detailed descriptions, Miller and Evan's Anatomy of the Dog, 5th Edition makes it easy to master the intricate details of canine morphology. Content has been updated throughout the text to reflect the latest knowledge regarding the development, structure, and function of the canine body. Chapters in the text are logically organized by body system and written by expert anatomists who lend their extensive knowledge of particular structures. Plus, there's a special introductory chapter on breed categories from the American Kennel Club to help you understand dog breeds and how they are determined. This new edition also features an enhanced focus on digital radiology and includes upgraded MR and CT scans throughout the text. Most notably, however, are the elaborate full-color illustrations by expert medical illustrators that bring complex anatomy to life in a way that no other vet text can. Overall, Miller and Evan's Anatomy of the Dog is an invaluable reference for veterinary students, clinicians, technicians, breeders, and animal specialists alike.